Even top players often make a mistake on end game safeties. How many times have you gotten to the end of a rack of 9-ball or 10-ball and you�re forced to play safe? At that point in the game, it is critical that you play the proper safety, the one that makes you the favorite to win the game. The thing is, there are certain shots that come up all the time and I�m amazed at how often players � even pros � choose a shot that actually makes their opponent the favorite. Diagram One shows a shot that comes up all the time near the end of a rack. The only remaining balls are the 8 and the 9, and the 9 is between the 8 and the cue ball. The 8 is frozen to the rail. You can�t bank the 8 because it is frozen and you run the risk of a double kiss. Even if you could bank it across, the cue ball will run up table, which makes the 9 a very difficult shot. 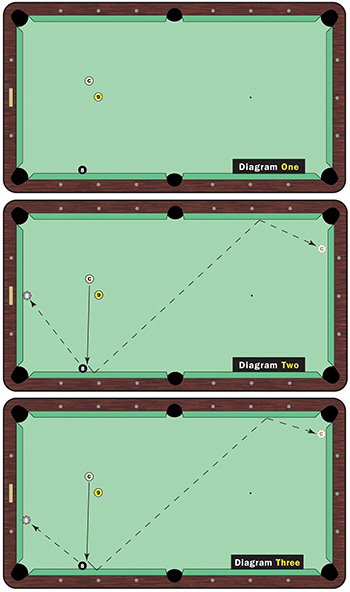 The most common response from the incoming player is a thin hit on the 8 ball to bank it to the middle diamond along the bottom rail and send the cue ball up off the side rail and up to the top corner pocket (Diagram Two). You would never see Efren Reyes or Francisco Bustamante play the shot that way because they know the percentages. Despite initial appearances, this shot gives you only about a 40 percent chance of winning. Here�s why: Unless you completely snooker your opponent you are in trouble because the return safety is easy. Simply split the 8, leaving it along the side rail where it originally was and leaving the cue ball on the opposite side rail, hopefully with the 9 right between them. Now your opponent is the favorite to win the game. Even if the 9 ball is completely blocking the 8, your opponent has the option to kick at it, particularly if it is even a few inches off the bottom rail. In that case, your opponent can simply kick the 8 back up table. You�re in a lot of trouble then because now he has created a lot of distance. The proper way to play this safety is to cut the 8 ball to the first diamond on the bottom rail and send the cue ball to the side rail and up near the top rail (Diagram Three). You should be able to easily control this shot, since the balls are so close together to start with. This is either a two- or three-rail shot. Now look at the result. It is virtually impossible for your opponent to get the 8 ball safe because you have taken away all the angles. The only option he has is to nick the 8 with a lot of spin, but you have to hit that shot perfectly and it is a difficult shot. Most players end up missing it or hitting it too thick and selling out. I think most players take the first option because they simply think leaving it in the middle of the rail is the safest shot. Plus, it is an easy shot, but in the end they are going to lose a lot more games than they are going to win using that shot. The option in Diagram Three is a very simple safety, but unless you have the knowledge of that particular shot, you�re going to make the mistake. It�s a very clever shot. You�re eliminating all the angles and most options. I�ve won so many more games leaving the 8 ball at that first diamond instead of in the middle of the rail. You see this situation a lot with the last couple of balls, but this knowledge can come in handy even if there are three or four balls left on the table. It�s a great shot.